With the C7 Corvette likely a long way off, GM is trying to keep the 'Vette bug alive by releasing a new version based on the championship-winning Corvette C6R. It's the Corvette GT-1 Competition Edition. The new Corvette GT-1 "Competition" Edition was announced at the NCRS meet in Florida last week by Tom Hill, the Quality Engineering Manager at the Corvette Bowling Green Assembly Plant. He revealed that the limited edition package would be named GT-1 Competition Edition and would start to roll off the line in the Spring. The GT-1 Competition Edition will reportedly be available on the Coupe, Convertible and Z06 models and will include everyone's favorite Corvette racing mascot, "Jake." For those of you who don't know "Jake," shame on you, but take a peak at the 2007 Laguna Seca-winning Corvette C6R for the most prominent view, or just lift up the hood on a ZR1 to find him hiding on the embossed intake runner. The package will be available in either 45U Velocity Yellow with black stripes or 41U Black with yellow stripes with "Jake" set within the stripe graphic. Of course, "Jake" won't be the only thing displayed on the GT-1 edition. Additional Corvette Racing-inspired graphics will include a yellow windshield banner, C6R driver's names on the roof, a list of won championships on the lower door, and black headlamps on the Velocity Yellow models. Also included are Genuine Corvette Accessories like body-colored door handles, carbon fiber-patterned engine covers, ZR1 full width spoiler in body color and five-spoke Q9V forged chrome wheels. The Z51 Performance Package will be included with the Coupe and Convertible models as well as the NPP Performance Exhaust. The already high performance Z06 will carry on as is. It won't matter which model you choose because each GT-1 Edition interior will feature exclusive GT-1 embroidered seats and console lid. If you select the Ebony 4LT package on the Coupe and Convertible or the 3LZ package on the Z06, you'll receive interiors and a shifter accentuated with yellow stitching. If your neighbors couldn't already tell, GM wants to make sure that everyone knows that you've got something special by giving each car a console trim plate with specific VIN sequencing and a numbered certificate of authenticity. 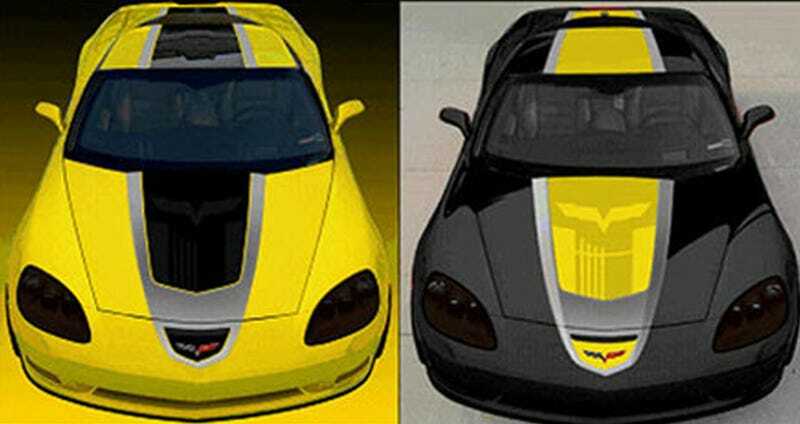 Does this sound a lot like the recently revealed 2009 Corvette Competition Sport Package? It should because this is basically just another stickered up, special edition Corvette meant to bolster sales. Sounds to us like GM is taking a chapter out of the recent Mustang history books. What's next, a Corvette Thanks-For-The-Bailout-Money Edition? Geez, just give us a C7 already. Corvette GT-1 Competition Edition pricing and availability will be revealed in February.